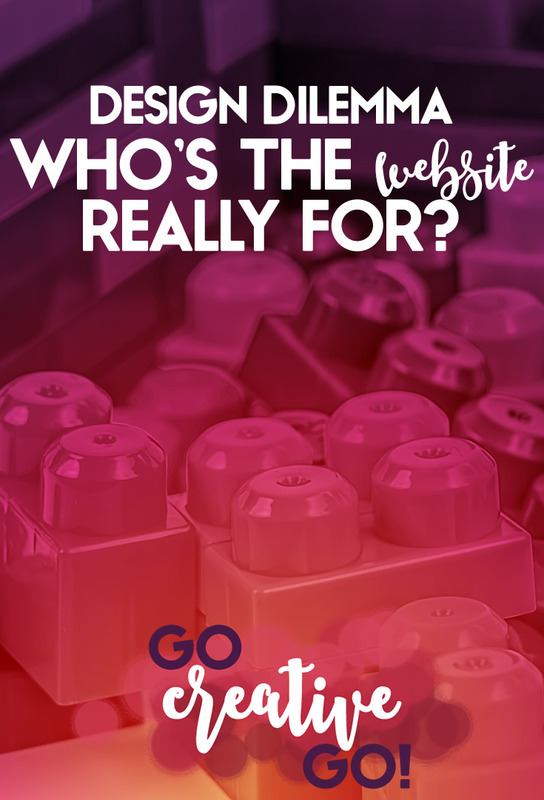 Design Dilemma: Who's The Website Really For? - Go Creative Go! I had the distinct pleasure of not only helping to organize and promote Atlanta’s 2016 WordCamp event, I also got to present on one of my favorite topics. Because my slides were designed to illustrate my point, not really to deliver the information included in my presentation, I thought it wise to write up my thoughts on website design and the balance required to create a website that both appeals to a target audience and actually conveys who the site owner is and what he or she is all about. The way I see it, prospects, projects and even long time customers come and go. But your relationship with your own online presence, your brand, your business, has to stand the test of time. If you want to build any lasting brand recognition, anyway! You spend a lot of time on your site. Shouldn’t you enjoy that site. If the thought of working on your own site makes you yawn and need a nap, then it’s time to consider a change! In order to be one it must also be the other! Without the proper balance your site can’t nail that know, like, trust trifecta. I then had a bit of fun discussing the “staged photo” phenomenon which is all the rage amidst younger female designers. I received many a laugh as I described artfully arranged clumps of aromatic herbs tied with pretty pink bows, gold scissors with no gook on the blades (meaning they’ve never opened anything), as well as open cosmetics and bowls of glitter. More laughs ensued when I brought up the idea of a “real desk” photo series. On my “real desk,” you’d find numerous coffee cups displaying a variety of different “skins,” a squirt bottle to discipline my office assistants (cats) and gummy garden variety scissors with the not so pretty blue or orange plastic handles. I don’t know about you, but I don’t leave my lipsticks uncapped on my desk. It’s rather un-hygienic, especially when you consider my office assistants would probably find a way to lick it. And open nail polish? There’s a disaster waiting to happen, and ruin my carpet. Why are so many using their websites to pretend to be someone they’re not? Why are so many emulating an aesthetic that can’t be upheld in reality? Check out the stinky faced slide. Can you smell the insincerity? Great article Mallie and great WordCamp Atlanta presentation as well! Your message truly resonated with me and left me with lots of take-home pearls that I’m applying to my sites as we speak. Twitter Talk: Your RT Is Not A Thank You! Beware The Vampires: Burglars Of Benevolence!